Bizarro is brought to you today by Lost Civilization Office Products – maker of Monk Copy Machines. At the height of its glory, the Aztec civilization boasted the largest city in the world, the most advanced sewage disposal and freshwater delivery system ever devised by humans, and a calendar capable of simultaneously predicting the future and decorating your living room. The scene above is of a typical Aztec community in the 15th century. Several members can be seen wearing the latest in Aztec technology, the calendar watch. 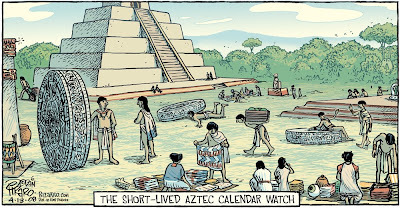 Yes, one of reasons those Aztec watches never caught on is, everyone wearing one was always late for work. Very funny, but I thought the Aztecs didn't have the wheel? Or was that the Incas? it's just as bad as the chinese abacus "calculator" watch, for some reason not as popular in the 80s as the ones casio came out with. i guess beads on wires is not as "cool".